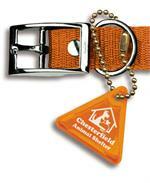 These exciting, slip-on Reflective Leash Covers represent a novel approach to pet and owner safety. 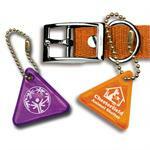 They easily slide over most standard leashes, are reflective on both sides and have a large imprint area. Prices range from $1.89 to $1.29. Reflective Leash Cover: 2" x 8 1/2"
These wider, slip-on Reflective Leash Covers represent a novel approach to pet and owner safety. They easily slide over most standard leashes, are reflective on both sides and have a large imprint area. Prices range from $2.49 to $1.69.